When Mary was predestined in one and the same decree with Jesus Christ by the design of God—before the creation of angels or the universe, and before the existence of sin or evil—she was predestined to be the Spouse of the Holy Spirit … to hold within herself all the love of creation. The form of the diagram shown in Figure 1 is not found in the work of St. Maximilian. However, it accurately represents the state of equal and opposite action and reaction, that occurs when two bodies make contact. In this case, the “bodies” represent heaven and earth: the uncreated and created orders, God and his creation. The first point I would like to make is that the state of equal and opposite contact forces in Newtonian mechanics requires “force equilibrium.” It may then seem very wrong to use an image like this one, because how can the state shown between God and his creation be in equilibrium? Isn’t God’s act of love so much greater than the return of his creation that no “equilibrium” would be possible? This would certainly be the case if it were not for Emmanuel, that is, God with us. Jesus, who is truly man, and truly God, belongs to both the created and uncreated orders simultaneously. In his person, Jesus is both the son of Mary, fully human and like us in all ways except sin, and the Eternal Son of God the Father, infinite and equal in all ways to the Triune God. Figure 1: The return of all created things to God the Father. Thus, the love of Jesus, the Word Made Flesh who is God, is by itself enough to “balance” the love of God. However, there is even more in the equation of love’s equilibrium than the love of the Son, infinite and sufficient in itself, though it is. According to St. Maximilian, the perfect love of the Trinity meets an adequate response in the perfect love of the Immaculate, which is the name St. Maximilian gives to the Blessed Virgin Mary. How is it possible that Divine Love can find an adequate response in the love of a creature? It is possible precisely because of the name that the Virgin Mary can claim for herself. In 1854, the Blessed Virgin Mary proclaimed to St. Bernadette Soubirous: “I am the Immaculate Conception.” In the words of St. Maximilian, the Blessed Virgin is the created Immaculate Conception, as in the words of St. Bonaventure, the Holy Spirit is the uncreated Immaculate Conception. 3 The Holy Spirit proceeds from the Father, and the Son ,as the perfect and infinite love between the Father and the Son in the eternal interior life of the Blessed Trinity. Thus, the Holy Spirit is truly all the love of the Most Holy Trinity. The Holy Spirit is also called the “Complement” of the Blessed Trinity, because he is the completion of the Trinity, not in “number” (quantitatively), but in essence (qualitatively). It is for this reason that Mary—though she is a creature in both her person and her nature—is herself the created Immaculate Conception, and, therefore, all the love of creation. She can actually provide an adequate response to the love of the Holy Spirit, who is the uncreated Immaculate Conception, and, therefore, all the Love of God. Thus, the equation of love’s equilibrium is balanced again. Now that we have balanced the equation of love’s equilibrium twice over, we could certainly stop. However, there is reason to continue. St. Maximilian does not expressly mention St. Joseph in the context of these reflections. However, the diagram in Figure 1, based entirely on the saint’s own reflections, certainly suggests the presence of St. Joseph in the order of the response of creation to God the Father. The order of Father, Son, and, Holy Spirit, shown in the diagram, reflects the order of God’s loving act of creation. This was initiated by the zeal of the Father, designed by the wisdom of the Son, and effected by the action of the Holy Spirit. 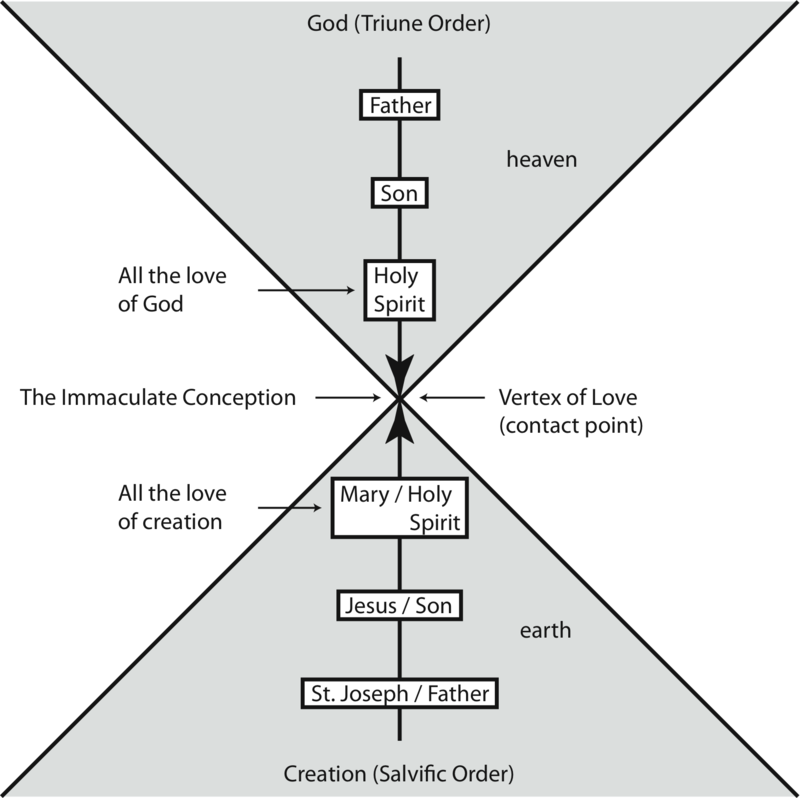 This is the order referred to by St. Maximilian when he says that: “the equal and contrary reaction (i.e., the return of all creation to God) proceeds inversely from that of creation.” We see this reflection in the diagram, where the reaction “force” of love is inverted, and the order of Father, Son, and Holy Spirit, as the “action force,” is reversed to give the order of Holy Spirit, Son, and Father. Thus, in accordance with St. Maximilian’s principle of action and reaction, what was first reversed in the order of God’s creative act, in the fullness of time, in the objective order of salvation, is reversed again in the subjective order of salvation. What was first reversed in the objective order of salvation means that, through the action of the Holy Spirit, Jesus Christ was incarnate of the Blessed Virgin Mary, and became man, and through him, love returned to the Father. 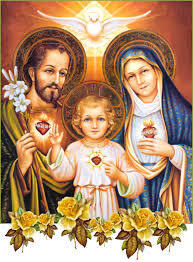 What was reversed again in the subjective order of salvation means that, in imitation of our patriarch and leader, St. Joseph, through the merits gained for us by the redemptive sacrifice of Jesus on Calvary, we can be transubstantiated into the Immaculate, and thereby form one Church, sharing her personality. Consequently, we share in her unique union with God in eternity, which is the Beatific Vision. This can be illustrated in the diagram shown in Figure 1, if one imagines traveling from the top of the diagram to the bottom, and then returning from the bottom of the diagram to the top again. Oh sweet heart of Mary, be our salvation. Next Post “The Fatima lifestyle is a shield of the Church for these perilous times”.